I've got a hit list of things to consider and questions to ask before buying vintage furniture online, so you can be sure to rule out a lot of issues before you take the big purchasing plunge. Buying things sight unseen can be scary, especially if you're like me and need to see things in person. Some people might say I'm picky, but I'd prefer to be described as attentive to detail. Beauty and quality of construction are usually found in the details of vintage furniture, and you can't always see those details in photographs. But sometimes you need to take a leap of faith to find the perfect vintage piece. Not sure where to begin? Check out some of my favorite online vintage retailers. I just took a major chance and bought a dresser on Etsy for my bedroom design (stay tuned for the big reveal!). It arrived this week, and I'm ecstatic about it. It's just about perfect, but I was extremely nervous to click the purchase button. 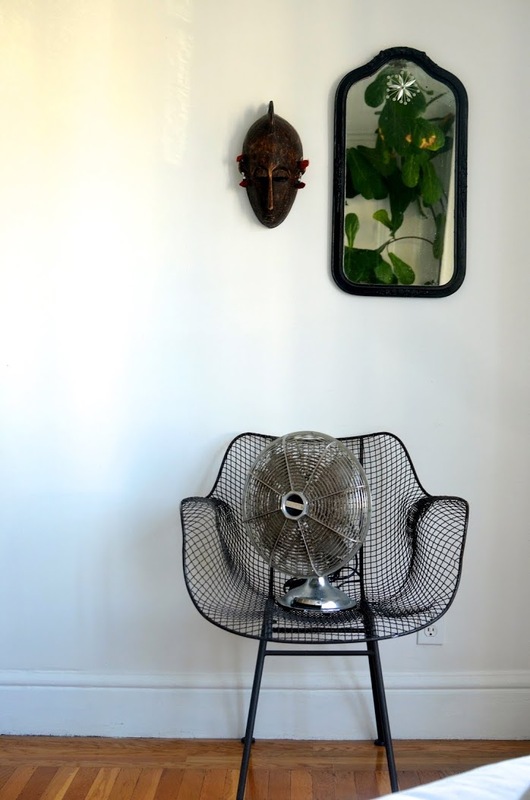 I've got a hit list of things to consider and questions to ask before buying vintage furniture online, so you can be sure to rule out a lot of issues before you take the big purchasing plunge. The key here is to figure out the quality and condition so you know what to expect and if you're getting a good deal. This is my first and most important question. Having vintage furniture in in your home creates a layered and unique space, but having a home that smells like vintage pieces is totally unappealing. So be cautious when buying vintage furniture online. It's really hard to get some smells out of vintage furniture, not impossible, but time consuming, costly, or both. Ask the seller if the piece smells and where they got it; sellers are usually pretty honest with their answers. Let them know that you'll be using the piece to store clothing or towels, and can't have your things absorbing any odors. 2. Is the hardware original? When buying case goods (wooden pieces like dressers or chests) ask the seller if drawer pulls and hardware are original. Well-made vintage hardware usually has some weight to it. When you're opening a drawer, you don't want to pull on a cheap reproduction knob, especially if you paid top dollar for the piece. 3. Do the drawers work? A drawer may open or close, but if it doesn't glide in and out smoothly, chances are you wont be using it daily. Ask sellers how the drawers work, if they glide smoothly or stick in any places. 4. Is it solid wood? The term solid wood is used a bit loosely sometimes. Technically solid wood means one complete piece of wood, not plywood. Ask about the type of wood that the outside, inside, and backside are made of. Pieces that incorporate particle board, even in the drawers, aren't as high quality as those that use solid wood, and are usually representative of pieces from the mid-twentieth century or later. You still might want to purchase it, but you want to make sure you're getting what you're paying for. 5. Are the joints dovetailed? You can usually determine the quality of vintage furniture when you see photos of the insides. Dovetailed joints are a great sign of quality, while drawers that are only nailed or stapled together are lower quality. Also, photos of the drawers and insides will show you if a piece is dirty or gross. Veneer gets a bad rap because of the cheap formica covered furniture from the mid-twentieth century. But really, there are a lot of amazing, high-quality pieces that use wood veneer. For centuries wood veneer was used as a way to finish a piece with very beautiful, expensive wood. Thin sheets of wood are layered atop a less expensive solid wood base -- just look for chips and peeling veneer when buying this this type of furniture. 7. Shipping will cost you! Shipping furniture is expensive, but it's almost always necessary when buying vintage furniture online (unless you live close to the seller). I just paid $260 to ship my dresser from Chicago to San Francisco, and that was considered a good deal. Ask sellers upfront about shipping because there are many options. They may set it up for you, or you can often set it up yourself. A great site to move large pieces of furniture is Uship, where movers bid for your business. Consider the price of shipping in your total cost for the piece. You don't want to price yourself out of a resale market (in case it arrives and you hate it). In general this is a good rule to follow. Sellers usually price vintage furniture according to condition and quality. When buying vintage furniture online, If it seems too good to be true, it just might be. Do your homework and ask your questions before jumping on something that has a bargain price tag. Don't buy standard vintage furniture online, the stuff that you see everywhere. You can buy those pieces in person at a local flea market or antique store. Instead buy vintage furniture you've never seen before or can't find in your local shops. Sometimes you've just got to go with your gut. As scary as it might seem you can get some great deals and amazing pieces if you're willing to take a chance. Have you ever purchased vintage furniture online?